The avalanche danger is variable and can range from Low to High. Travelling early in the day is recommended, as conditions can change rapidly in short periods of time due to daytime warming. Pay careful attention to the integrity of surface crusts formed overnight and rising air temperatures during the day. Dry slab avalanche danger may also exist during spring snow storms. Natural and human-triggered avalanches unlikely. Small avalanches in isolated areas or extreme terrain. Natural avalanches unlikely; human-triggered avalanches possible. Small avalanches in specific areas; or large avalanches in isolated areas. Natural avalanches possible; human-triggered avalanches likely. Small avalanches in many areas; or large avalanches in specific areas; or very large avalanches in isolated areas. Natural avalanches likely; human-triggered avalanches very likely. Large avalanches in many areas; or very large avalanches in specific areas. Natural and human-triggered avalanches certain. Large to very large avalanches in many areas. Significant snowfall over the last week combined with two periods of strong to extreme wind has created widespread storm slabs in the alpine. These are primed for human triggering. Minimize exposure to large slopes and cornices in the alpine. New snow will require several days to settle and stabilize. 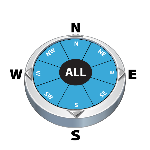 Use conservative route selection, stick to supported terrain features, avoid overhead hazards. Lower elevations and South aspects will have a crust from Saturday, but intense solar inputs will weaken these crusts on Sunday allowing for wet loose avalanches later in the day. Travel and return early before things heat up. If triggered, loose wet sluffs may step down to deeper layers resulting in larger avalanches. Use extra caution on slopes if the snow is moist or wet. Are usually small, but may gain significant mass on long steep slopes. Are typically limited to steep terrain (40+ degrees). Stabilize soon after a storm, usually within a few days. Avoiding terrain traps and large steep slopes until the surface has stabilized. On large steep slopes, occasionally move across the fall line to avoid being caught by your own sluffs from above. Are more powerful than dry loose avalanches due to their higher density. Are often limited to sunny slope aspects. Are commonly confined to the warmest part of the day. 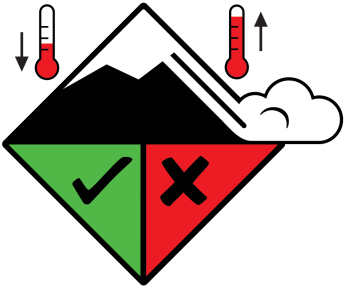 Avoiding start zones and avalanche paths when the snow becomes moist from daytime heating, from rain, or does not freeze overnight. Vary in size from small to medium. Occur on steeper lee and cross-loaded portions of slopes (typically 35+ degrees). Are often limited to specific terrain features such as lee ridge-tops. Can often be recognized by the appearance of the snow surface, changes in surface snow hardness, hollow, drum-like sounds and/or shooting cracks. Winds that vary in strength and direction can produce complex and unexpected wind slab patterns. Stabilize fairly soon, usually in a few days to a week. Recognizing and avoiding areas where wind slabs have formed, until they have stabilized. Vary in size from small to very large. May be soft slabs, fooling people into underestimating slab potential. Tend to occur on moderately steep slopes (35+ degrees). May occur in all terrain, but are larger and more frequent in the alpine. Conservative terrain choices during and after storms until the storm snow has stabilized. Involve wet layers in the snowpack, typically including deeper layers. Occur when water forms or penetrates below the surface of the snowpack. Avoiding start zones and avalanche paths when the snow becomes wet from daytime heating, rain, or lack of an overnight freeze. Slide on buried persistent weak layers, which often form during clear periods and may involve deeper layers from multiple storms. Vary in size from medium to very large and may cross terrain barriers to involve multiple slide paths. May occur on very gentle terrain, even slopes of 20 degrees or less. May be localized to specific elevations, aspects, or regions. There are often no visible signs of persistent slab instability. Lack of avalanche activity and lack of danger signs are NOTreliable indicators of stability. Compression tests and Rutschblock tests may locate persistent weak layers. Stabilize slowly, tending to persist for several weeks or longer. Often have dormant periods, becoming active again when the weather changes. Are prone to lingering pockets of instability that persist long after most areas have stabilized. Tend to release above the trigger, making it difficult to escape. Are often triggered remotely from a long distance away. Allow extra time for persistent slabs to stabilize and use a very cautious approach to new terrain. Be especially cautious after storms or during warming periods. Slide on deeply buried persistent weak layers, which often form during clear periods or rain-on-snow events early in the season. Involve thick, hard slabs, sometimes the entire snowpack. Tend to be very large, commonly cross terrain barriers to involve multiple slide paths. Tend to occur on larger slopes of moderate steepness, typically 30-40 degrees. There are often no visible signs of persistent deep slab instability. Lack of avalanche activity and lack of danger signs are NOT reliable indicators of stability. Stabilize slowly if at all, persisting for months and often the entire season. Dormant persistent deep slab instabilities often become active again when the weather changes, especially after storms or with warm spring weather. Very conservative terrain choices and a very cautious approach to new terrain. Be especially cautious after storms or during warming periods. May trigger large slab avalanches on relatively stable slopes below. Are often associated with recent wind loading and/or temperature changes. Can be triggered from ridges, sometimes breaking surprisingly far back onto ridge tops. Avoid travelling on or near overhanging cornices and limit time spent exposed to slopes below cornices, especially soon after wind events and during periods of warming temperatures. Cool temperatures with freezing levels at valley bottom are expected Saturday night. Generally clear skies (lots of solar heating!) and light W winds are expected on Sunday. Monday looks similar with a bit more wind and slightly warmer temperatures. 60-100 cm of snow in the last week with snowpack depths reaching seasonal highs above 2000 m. Strong to extreme W winds with 20-40+ cm of snow on Friday created widespread storm slabs in alpine areas and sluffing in steep terrain. This recent snow sits on a variety of surfaces above treeline. Moist snow at lower elevations and on solar aspects. On Saturday Visitor Safety staff observed widespread natural and skier triggered slab avalanches up to size 3 above 2000 m with 1-2 m thick crowns, especially on North and East aspects. Wet loose avalanches were observed to size 2 at lower elevations and steep south aspects, with sluffing on steep N aspects and several new cornice failures.